Angel Pine against the backdrop of Mount Chiliad. 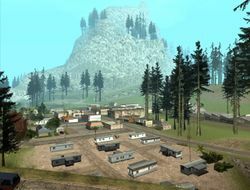 Angel Pine is a moderately sized town located in Whetstone, San Andreas, nestled between the large landmark of Mount Chiliad, immediately adjacent and the forests of Shady Creek with a population of 6,412. It boasts an amazing view of the mountain and is virtually a minute away from the eeriness of Shady Cabin (situated in the heart of Shady Creeks) and minutes away from San Fierro if you take the highway in south Foster Valley. Sitting at the base of the enormous Mount Chiliad; this small-town suburbia is host to the logging company Angel Pine Sawmill. There is a save point in the Angel Pine trailer park and the Angel Pine Safehouse, which can be bought for $20,000. Angel pine also houses several facilities, including a Sheriff`s office and the Angel Pine Medical Center. The player will automatically be in Angel Pine after completing mission "The Green Sabre". After the deadly Mulholland Intersection shoot-out with the Ballas in Los Santos, Carl Johnson is forced by C.R.A.S.H. officers Frank Tenpenny and Eddie Pulaski to perform various tasks for them, using the recent incarceration of Carl's brother Sweet as leverage. Tenpenny and Pulaski deposit Carl in the remote town of Angel Pine in Whetstone, a region of Flint County in San Andreas. Carl, who has been stripped of all weapons and given only a camera, is ordered to flush out and murder a witness who is hiding in a cabin on nearby Mount Chiliad. He rushes up the side of the mountain to find a cabin closely guarded by the FBI. By creating a commotion, Carl succeeds in luring the terrified witness from the cabin, who races down the mountain in a car. After chasing him down, Carl kills him and photographs his body as proof for Tenpenny and Pulaski that their problem has been taken care of. Later in the story, Angel Pine returns, this time as the setting for the air-drop Carl is asked to perform by Mike Toreno. In order to stay within the diligent gaze of those watching him, Toreno compels Carl to fly a Rustler to Angel Pine for him in order to drop supplies to his men holed up there. Carl is given a very limited time to fly over topographically diverse terrain from the abandoned airstrip in Bone County to Angel Pine and back, all while remaining below radar detection range. The Angel Pine sheriff's office. The town has trash cans filled up with unused maps of Vice City. 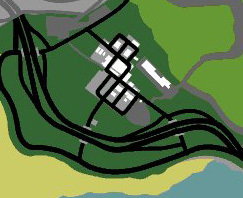 Many of the stores in Angel Pine have been reused from Grand Theft Auto: Vice City. Angel Pine is probably based on Lone Pine, a very similar small town at the foot of Mount Whitney in California. This page was last modified on 10 November 2012, at 22:34.